In today’s sneak peek we are proud to announce that our designers and developers are hard at work bringing a new and improved color management system to Divi. 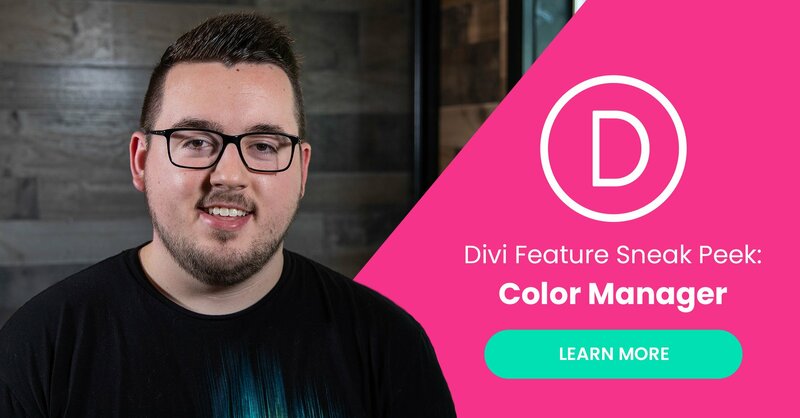 Divi’s new color manager will be a massive improvement for designers wanting to easily use a consistent and harmonious color palette throughout their website. Of course, Divi already makes it easy for users to save their preferred color palette in their theme options and retrieve those colors throughout Divi’s modules, but this new and improved color manager will bring some powerful new functionality that is sure to save time and improve your color choices. Divi’s new color management system will make choosing the right color easier in any situation. Where Divi’s new color management system separates itself from the current one, is with two new functions that make creating and iterating on your color choices fast and easy. Not only giving you the confidence to experiment like never before, but the ability to end up with better results. We’re all familiar with Saved Colors, which is part of our current color management system. But the new color management system also saves Recent Colors. 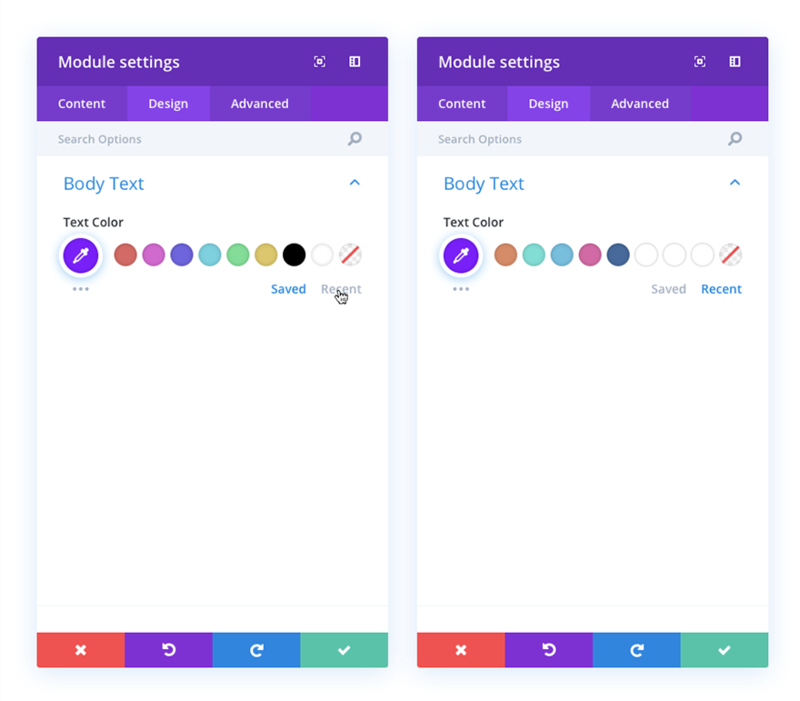 It will identify and save the eight most recently used colors throughout the Divi Builder so that you can quickly and easily view and select them for whatever element you’d like to add a splash of color to next. Then things really get interesting with Divi’s new Suggested Colors feature, which analyzes the colors you’ve already saved/used and provides you with a palette of suggestions that compliment them! Taking the guesswork out of finding secondary or complimentary colors to those you’ve already used. We’re excited to make this new color management system a reality for Divi users everywhere. We’re confident that it’s new functionality will be a game changer. Like having a designer on hand at all times to help with one of web design’s trickiest tasks, color selection! We hope you’re excited too! As always, we can’t wait to see what you think of this fun and useful new feature, currently in the works. Let us know what you think and how this will affect your web design work in the comments. Yeah, big wow…..can’t wait to see this in action it should really help with creativity and keeping colour scheme consistant plus hopefully suggest some really cool complemenatry colour that you wouldnt have thought about in the first place, great stuff! Deadly!, the way you show the suggested colours. All this is very subjective! Who’s stopping you to choose harmonious colors now? Você é chato, hein! Deixa o pessoal sugerir novidades para quem está começando agora, gente! Deveria ser aquela coisa: quem não tem um comentário positivo ou construtivo para oferecer, deveria ficar calado. I think you are missing the point. I have several utilities for finding harmonious colors but I hardly ever use them. Having this feature built into the page builder…and at my fingertips when I am making color choices…will definitely encourage me to use it all the time. Google diktat for SEO and rankings. Doesn’t come with a manual or spoilers! Price: your sanity. Just upload a PDF with scope and design schema and Divi will build the site you want…. Well Tim if all we needed to say was something like “Okay Divi, design me a website for a restaurant.” and we had to do no work we can create more websites in no time at all. But this will be a hidden feature only for (lazy-smart) clients/developers that have been using Divi since v1. How exciting! This will be a very helpful tool for my build process. Is there a projected time of release for this new feature? The “download today” button like thing in the thumbnail is not appropriated to the content which is a sneak peek. It should say something more like “download soon”. This is the 5th sneak peek with no matching Divi update. The current pace is 1 s/peek a week and 1 Divi update a week. So we have for now 5 weeks offset between a s/peek until a matching update. This can go increasing. Why ? By watching the s/peek Nick made one year ago (April 2017), just before the first s/peek of this year 2018 made by Nathan, I just felt that the Divi updates we have now match the announces he made in that video. That’s a one year gap guys ! Okay Nick said the dev team has doubled. Good, but it should reduce this gap to something like 6 months (I could be widely wrong. Just speculating here). So if my reasoning is good (hope no), we have a gap around 1 month and 1 week (5 weeks ) to 6 months !!! Some of the 500k users won’t be happy. About today’s sneek peak, I hope this smart color management system won’t be interfering too much with the global color settings by changing the colors we set. You’re probably right, since all the previous weekly update where minor ones. I mean minor because of the low changes they bring to Divi global system. So this reasoning would be confirming the scary months gap. This shouldn’t happen because there is “saved” tab and a “recent” tab. When “Massive improvements” are made does it mean that the original version was a load of rubbish? Plenty of subscribers to this outfit have made comments about some of the rubbishy design of the website itself. Take the top menu for example. It’s the easiest thing in the world to hide menu items etc. from logged in or logged out users and yet fully paid up members have to suffer being bombarded with “Join to download” flyouts and popups as well as the menu item itself. I am a lifetime member and have yet to discover where to find a comprehensive listing of ALL available downloads that I have paid for. No, “massive improvements” means it’s a lot better now than it used to be. I agree that the website should go thru some updates considering customer segmentation. Which is exactly to avoid having pop-ups for lifetime custommers like ourselves. login > Scroll down a bit > View All Downloads. And by the way, ET tools that should be downloaded are on the first page (Divi, Extra, Divi Builder, Bloom and Monarch). The rest is too old and does not receive updates. I guess its only there for sentimental value. ET should consider removing them, in my opinion. Another sneakpeek that will……. never come to life???? Give it time we are going to have another theme update next week. There was a sneakpeek for dynamic content, header, footer, etc like 1 or 2 months ago that is not yet in Divi’s update! Just asking when very (more) important updates will be available. The people at ET do not like to give out time lines for the updates. I like that we are now supposed to be getting one feature update and one teaser video a week. That really shows that they care about us. Dude, they only started sneak peaks a few weeks ago and the first 2 (making divi dynamic and the theme builder) are both significant updates that will likely take awhile. Yes I for one really want those updates more than anything and yes I believe ET was late starting on them compared to the competition, but at least they are working on them now. If these features don’t show within 2 months of being sneak peaked, maybe then you can complain away. I think they had a head start on those updates before the teaser video was created. I just can’t say how long it takes to get to a release version for one of those major updates. Want to bet they will all come together as Divi 4. Notice how the features since 3.1 have had nothing to do with the sneak peeks and are incrementing 3.1 to 3.5 fairly rapidly. I have to sheepishly admit that I have never used the color management tools in Divi, because when I first looked at them a year or so ago, they seemed wonky and not fully fleshed-out. You have my promise to go and have another look! It would avoid a lot of back-and-forth with the style guide. 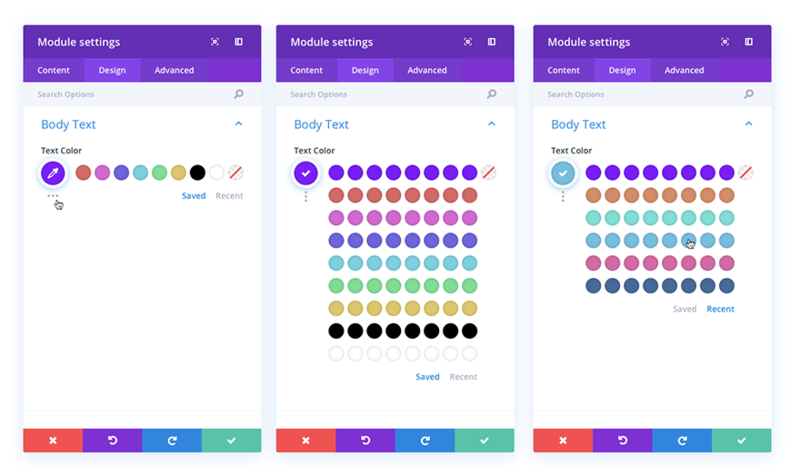 The recent colour option could be useful, but won’t it get flooded with similar colours when experimenting with different shades for a single element?… Or will a colour only be saved to the recent list when the entire module etc is saved? This looks wonderful and a great addition to designing, but hoping it might address (or fix) one of the things that have been a stumbling block for me. I am still experiencing a bug (don’t think it’s a feature… lol) in the current color management where as if you save a new custom palette in the theme options (after having already built out some pages with the default palette), it doesn’t update on existing modules when editing pages. I currently have to save my layout from the existing page, build a new page and then import my previous layout to access the new palette. Confirmed ! This the way it works,and You have the correct workaround. +1 I also have this issue. Have reported it a long time ago and they simply don’t fix it. Good to know there is a workaround, but his should really be fixed in an update. Surprised this wasn’t there when I first started with DIVI, good to see it there now. I am assuming this is using complementary…. If possible I would also include split complementary and triadic color suggestions. Wow, this is going to be great as at the moment I am using a color picker to save my colors. I am very much looking forward to this. Keep up the innovative work, Divi Team! I came searching for a comment like this. Global colours… could the Divi colour palette be used globally, so if you set colour 1 for things, then change colour 1 – everything that’s been set to use colour 1 changes? This would take Divi from being less CSS and more SASS/LESS. Please? I’ll have to remember this style of development. Is there, or will there be, color managment that allows object ids to effect color changes website wide? Of course, this can be done with CSS, but the point to using Divi is the point and click ease of use, at least for me. If that is not going to be available in the theme, does anyone know of a plugin for global color? My brother’s group has 14 websites. They asked me to help out by putting one site together and they want to change the color palette and content between sites. Love it! Forget voice, though, and focus on retroactivity next, so I can use suggested colors for the websites I designed last year. Please and thank you. Devi theme is really excellent, waiting for more color option. Please focus on mobile interface, I expect it will more interactive as like apps. I am really looking forward to trying this new feature. Specifically the suggested colors. Really curious about when the hover effects feature will be coming out too. Thanks for all these wonderful improvements to Divi. What would be super awesome is color aliases. So I could make a list like Primary1-Primary5, Secondary1-Secondary5, etc. as many of those I want. And then say if I change the RGB for Primary1, every place I spec’d Primary1 would be automagically updated. In terms of updates, I really wish the more Requested, Needed & Essential ones are pushed out, more than this. And note for video: I couldn’t finish it, because music in background was too loud, the guy seemed like he was screaming at the mic/monitor, and just too much script.. cut it down to no music, few meaningful and straight to point words, visuals (if available) and that’s it. For a moment I got exited thinking you are going to implement mu suggestion of being able to replace a color side wide and to implement color themes. Then I continued reading and saw it’s only saving the last used colors and suggesting complementary colors. I wouldn’t call this a ‘color management system’, that name suggests a whole lot more then that. 2) Let each color setting link to a color pallet box in stead of the actual color, that way, when you change the pallet it automatically changes every where. It’s basically the same way Microsoft Office works with colors and themes. You could even have an option to create multiple pallets (color themes to quickly swap all colors of a website). There is a screenshot in my suggestion. Have a look there. just keep the speed of the builder in mind, but I’m pretty sure you do ! I would much prefer a major change to modifying the menu system. It’s clear ET is allowing others to make money off of that. Come on ET let’s see a highly customizable menu system without hacking all the css. As an aside, I love Divi! I agree 100%. I think the reason more of the communities suggestions are not implemented is to avoid stepping on the toes of plug-in developers. Many of the most used plug-ins should be standard features. I’m still ANXIOUSLY awaiting starting three new personal projects for the CPT inclusion. Anything else is just MEAN! I suppose that means I can then save a custom color palette in EXTRA also. Until now EXTRA does not even give that option. Nathan, man! You really are a good speaker! I love the way you present stuff and use different intonations and timing for dramatic purpose. Oh, and by the way: I think this update is really time-saving and removes the dull process of having to choose every color of your website.